Color, Cut and Glue: Seussed Up or Seussed Out? Seussed Up or Seussed Out? We're three days into our Dr. Seuss celebration and I must say, it's been fun. We've enjoyed a flexible schedule and created an art project or two. However... today was off the charts. Seriously... we took a wrong turn just prior to 7:45 this morning. Here I thought we were going to have your basic Read Across America kind of day. Apparently, it's not that simple. Someone decided a Dr. Seuss cake in the lunchroom would not be sufficient. Let's step it up a notch! Will Friday actually arrive on schedule this week? Or is someone playing a mean joke on me? In any case, here are two more door decorations for your files. The one on the left is my own. it was actually accepted for publication! 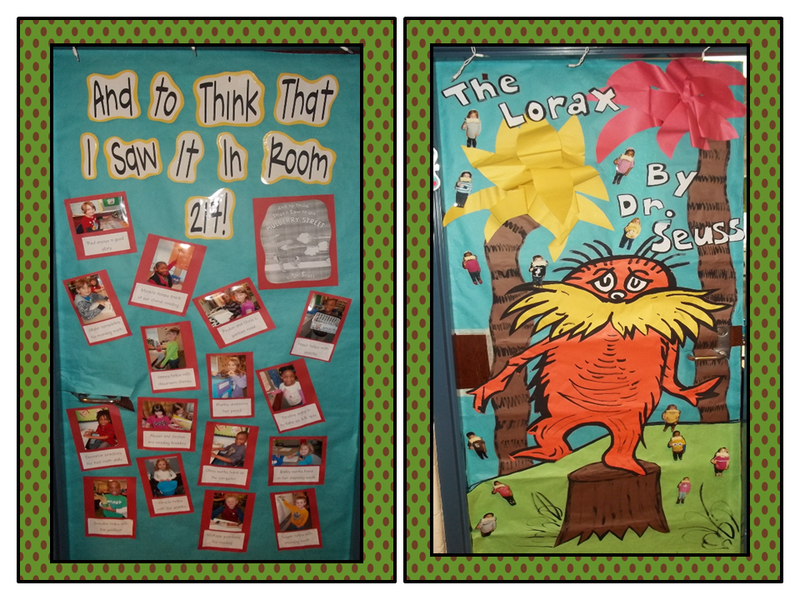 The Lorax door was created by one of the K teachers on my hallway. So... how is your week progressing? Do you look forward to special occasions at school or do you appreciate the "regular schedule" more?